6 Ton Overhead Crane Portable Bridge Crane Mobile Crane FromBest Crane Manufacturer In China! 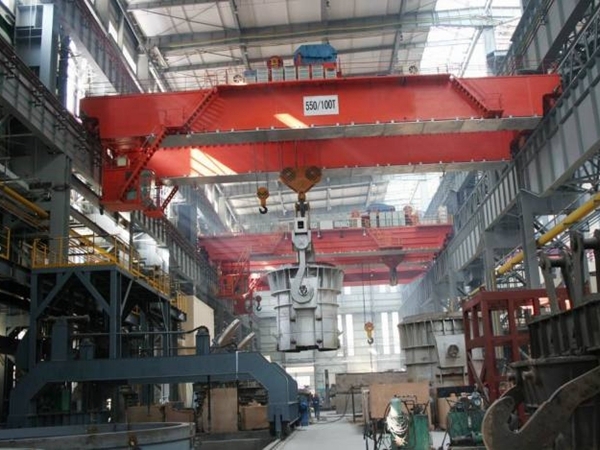 6 ton overhead crane is one of small lifting cranes. With light weight, small size, compact structure, it is widely used for lifting and transporting material in warehouse, workshop, factory, processing line. It has flexible move and fast speed, which makes 6t crane very easy and safe to operate. Thus it is first choice for light duty work! Ellsen Group, a professional crane manufacturer in China, supplies kinds of lifting cranes with great performance and ideal price! Buy Ellsen bridge cranes for high quality and low price! As a small and portable crane, 6 ton lifting crane has many different types to choose. 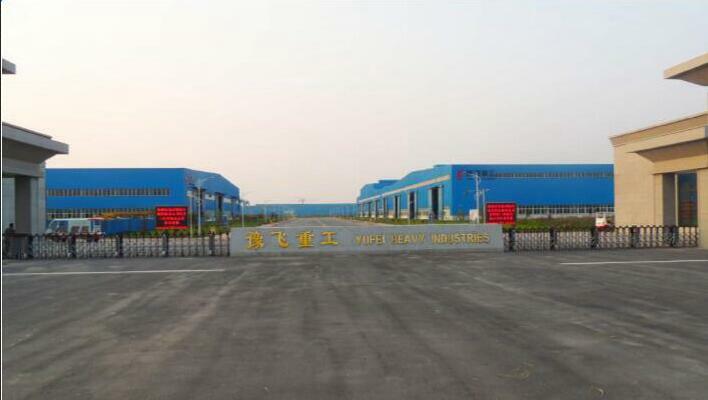 As for special using purpose, it includes explosion proof bridge crane for coal mine, warehouse grab overhead crane, warehouse electric single girder overhead crane, workshop single girder overhead crane, workshop grab overhead crane, customized single girder low headroom overhead crane, grab bridge crane. According to size, it has portable bridge crane, garage overhead crane. These two cranes have tiny size, flexible move and simple structure. They are convenient and safe to operate. 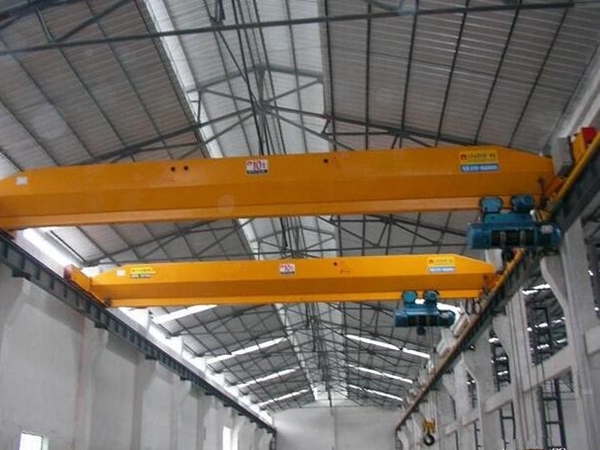 6 ton overhead crane is designed as single girder crane. The advantages of 6 ton single girder traveling cranes are obvious. 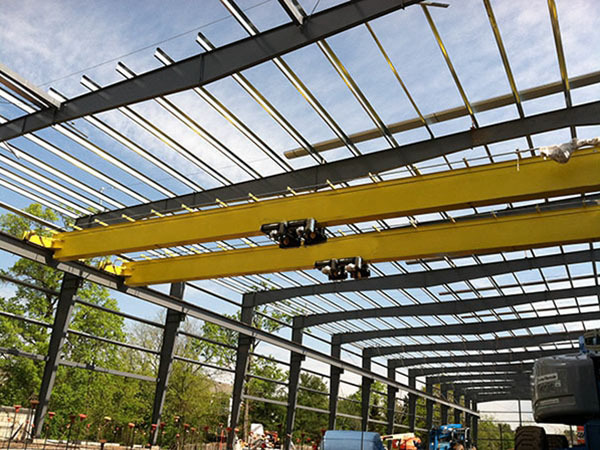 With load capacities up to 20 tons and spans up to 120 feet, with a low headroom monorail hoist, 6 ton crane has low dead weight and more headroom. It is the most economical solution in buildings with a span over 90ft. It just needs lower production cost, and therefore it has lower price than a double girder model or heavy crane, like 100 ton gantry crane. Small cranes, like 4 ton overhead crane, 5 ton overhead crane, they are best choice for light duty. Lighting switch box, it can ensure the power supply of working lighting and ringing. Travelling limit switch, it can make the machine driven by motor work in certain area, and avoid accident. Emergency switch is installed at the side of cabin. Under emergent condition, the driver can easy and fast to cut off the power of controlling circuit. Door safety switch, it is installed on the door and hatch. When someone goes up or down the crane or walks on the crane, this switch can avoid accident caused by the driver. Fuse device is used to protect controlling circuit short. Zero contact of controller, it can protect zero-place starting and avoid supplying power when controller is on working place. Ellsen pays attention to every crane parts installation, such as runways and end trucks. Runways are best for top running crane and under-hung crane. Ellsen can retrofit existing runways to add capacity or incorporate an entirely new runway system to save time and money. Ellsen fits runways with anti-collision devices, fixed and adjustable wheel stops, hydraulic bumpers and other safety features. Ellsen also install end trucks with the highest quality safety features and precision design. Ellsen standard features can fit up to 24” wheels, fixed and rotating axels, single girder and double girders, top running and under-traveling designs for Ellsen end trucks. 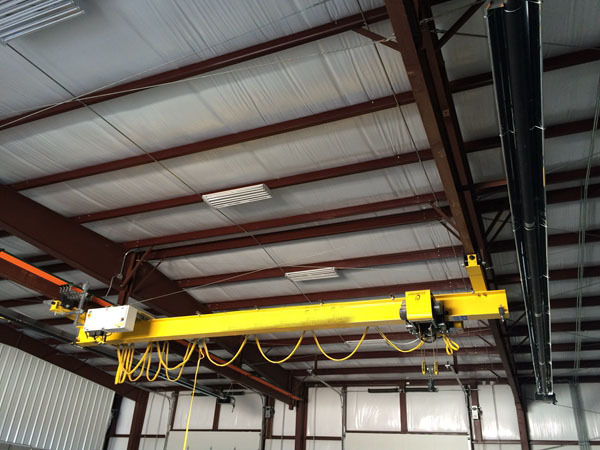 For the best installations, designs and customized features, just choose Ellsen crane! Ellsen serve facilities of all types, inside and outside, military, manufacturing, shipping and other industries. For any question, just send crane quotation to sales@ellsenoverheadcrane.com. Single girder bridge crane is a kind of lifting device that cross factory, warehouse and store yard to lift material. The ends of cranes lies on concrete column or metal bracket. The shape is similar to the bridge. 1.Every bridge crane should hang rated load sign on obvious place. 2.When the crane is working, one one is permitted to stand on the bridge. 3.Every operator should have license. After drinking, no one is permitted to operate crane. 4.Concentrate on the operation, not talking and smoking. 5.Keep the crane tidy and clean. Keep all devices, tools, flammable and explosive material in order. 7.For the following conditions, the crane is not allowed to lift material: the material is not fixed firmly; the crane is overload; the signal is not clear; the flammable and explosive material don’t have safety protection devices; the wire rope doesn’t conform to safety standards; lifting mechanism has troubles. 8.When the crane is working normally, the hoist hook must be away from the ground 2m. 9.If the material weight is less than 50% of rated weight, two mechanisms can work at the same time. If the material weight is more than 50% of rated weight, only one mechanism can work. 10.For the crane with two hooks, the main hook and vice hook, not lifting or downing main hook and vice hook at the same time. An LED Lighting Retrofit can help you save money, Ellsen provides good overhead bridge crane lighting and give your crane a modern look. Replacing crane lights and bulbs can be expensive. 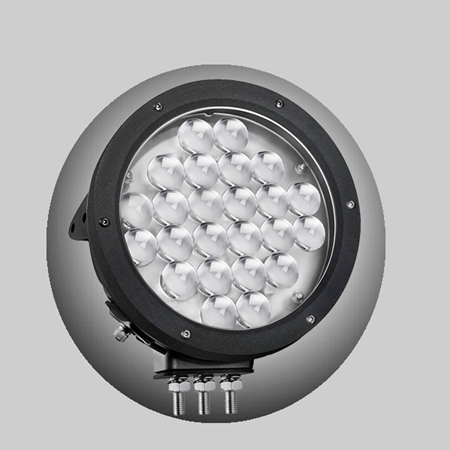 Traditional lights have a limited service life and can suffer from damage due to vibrations resulting in increased costs and less efficient operations. 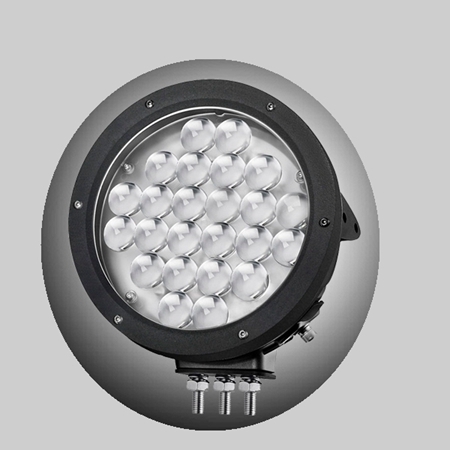 With an LED Lighting Retrofit you get lights that have a much longer service life, and will be far less prone to damage from vibration. Traditional lighting accounts for 50 to 90 percent of electricity used by a crane. 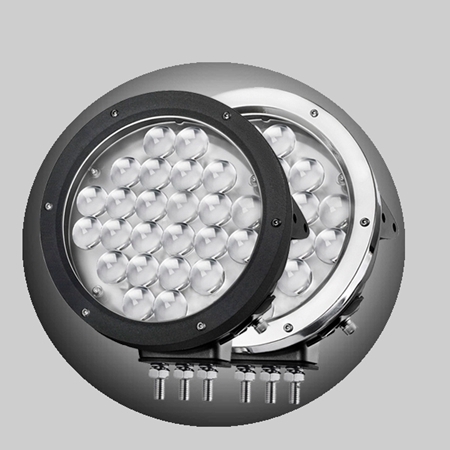 An LED Lighting Retrofit can therefore result in a major cost savings in any crane operation. 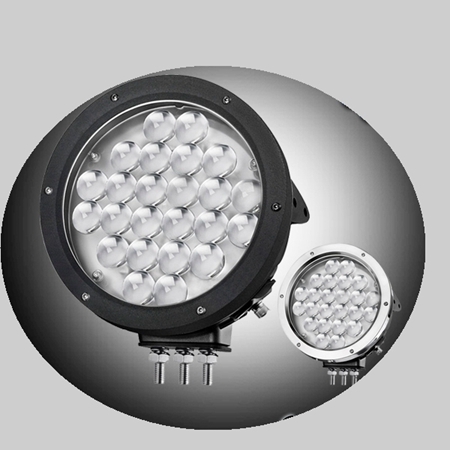 LED lights provide the same degree of lighting to the working area than standard lights, yet consume little more than one third of the energy. 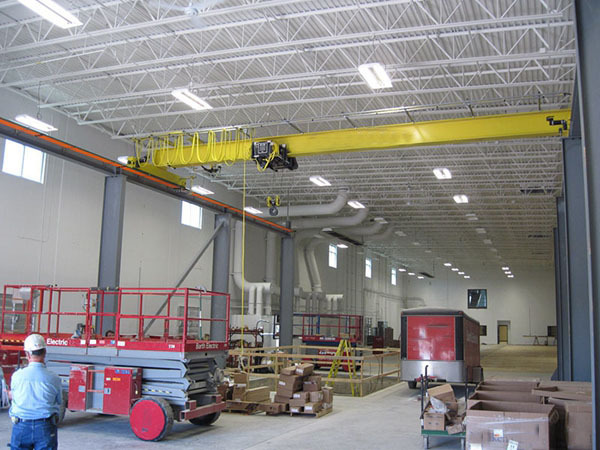 This means that with LED lighting you are able to cut your energy consumption by up to 60% per crane. 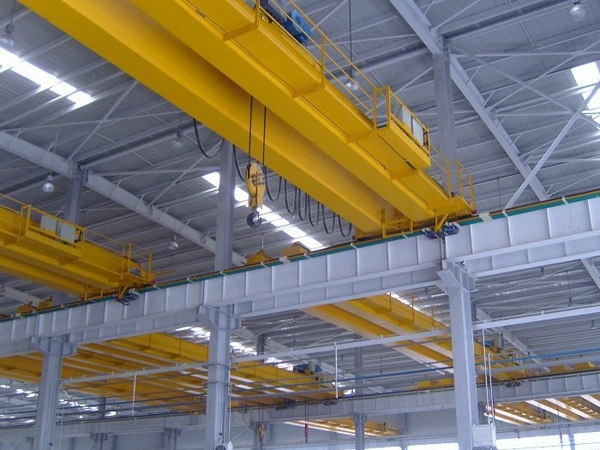 According to girder structure, overhead crane is divided into two types, single girder crane and double girder crane. 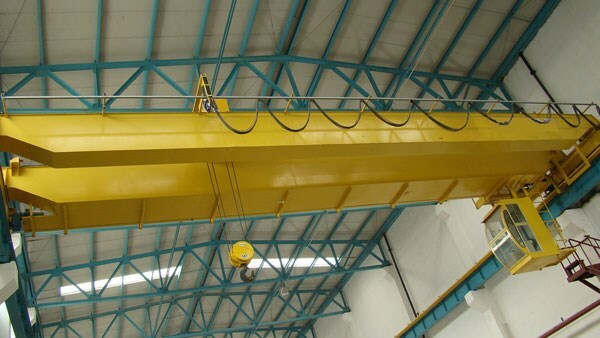 Single girder bridge crane includes electric crane and manual crane. Compared with electric single girder crane,manual single girder crane has slower speed, smaller lifting tons, simpler produce and less cost.The trolley of manual single girder crane is manual monorail trolley. 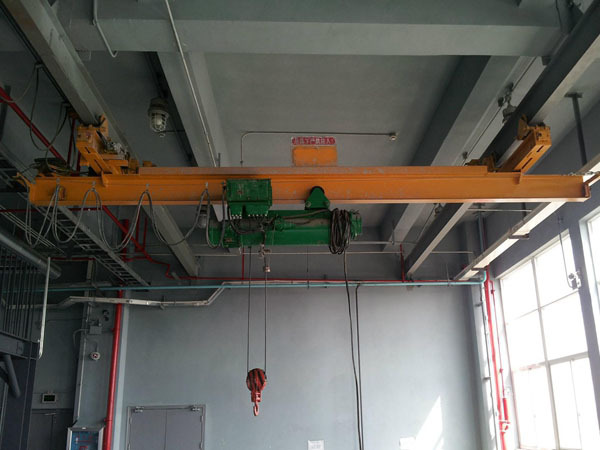 Lifting mechanism adopts manual hoist. The crane frame is composed of main girder and end girder. Electric single girder crane has faster speed, larger lifting tons. Electrical bridge crane is composed of crane frame, crane traveling mechanism, electric hoist and electrical devices. Electrical single crane has wide application because of convenient use and high efficiency. 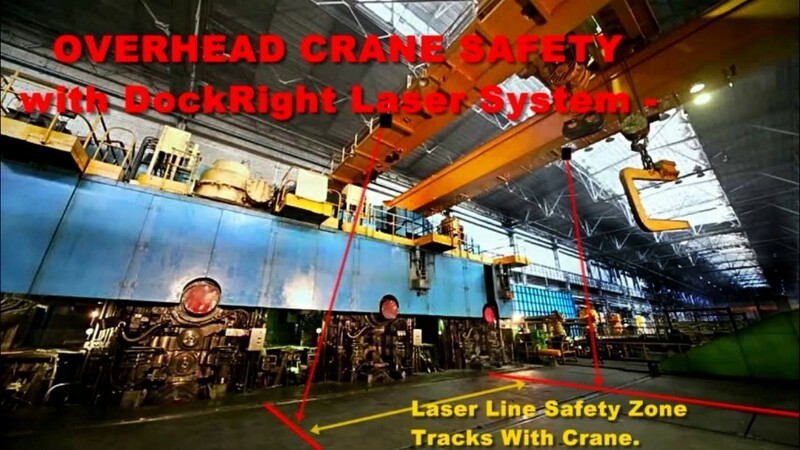 Why LED lights improve safety on overhead cranes? Reduce accidents!! 80 lift and material handling equipment workers are killed each year, on average. Reduce incidences of human error – pedestrians are more aware of moving load. Pedestrian sees projected line or spot on floor – knows his proximity to the moving load. 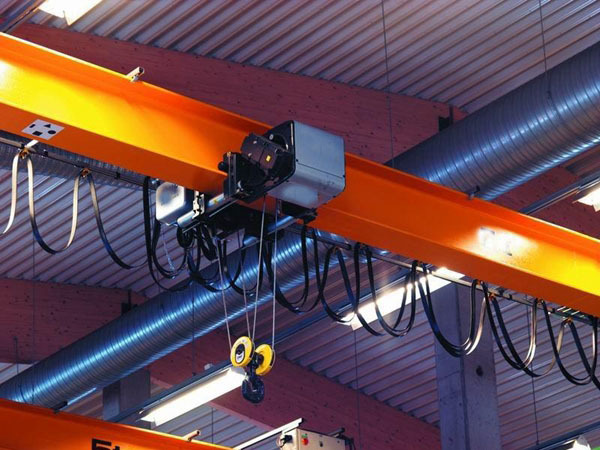 Very effective for overhead cranes working in areas with many pedestrians. Pedestrian workers can get “immune” to the beeping sound of overhead cranes in use. Beeping audible alarms do NOT provide a pedestrian with a sense of proximity to the load on the crane. Crane operators have a new “frame of reference” as to the exact position of load/hook above the floor. Significantly improves operator control of the load, especially when exact positioning is required. Operators do not have to take their eyes off the crane block or load to know trolley is centered over the load. LED lines can create a square “box” around the load/hook on floor below – obvious “danger area”. Pedestrian worker sees colored line or spot on the floor – knows load is moving and his proximity to it. Snap on lens cover turns spot on the floor into line on the floor – allows user to “box” in the hook. Moving lines/spot on the floor prevents pedestrians from walking under suspended load. Powerful 24 LED 120 watt light projects spot or line (with snap on lens cover).